This workflow describes the steps to create a mosaic dataset using the Multiband Composite template. Choose one of the multidimensional raster types: GRIB, HDF, or NetCDF. The selection sets the options available for Processing Templates parameter. Choose the Multiband Composite option in the Processing Templates parameter. When selected, the Raster Type entry will updates to the mosaic dataset. If your input is only one or two files, choose the File or Dataset option rather than the Folder option, as it performs faster. 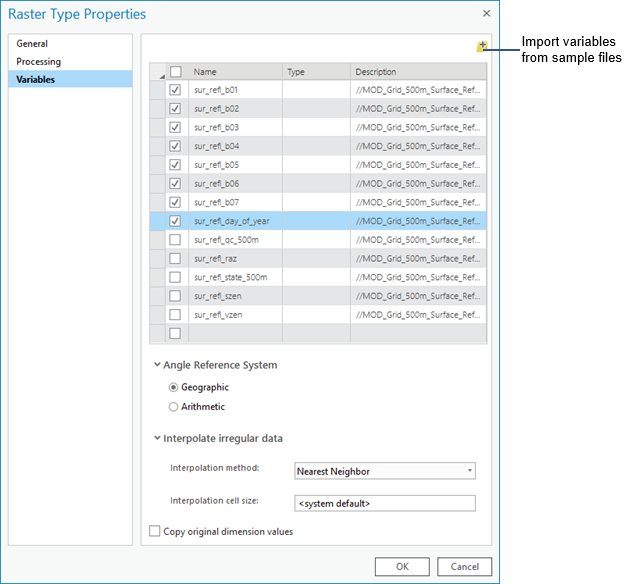 Click the Properties button, which opens the Raster Type Properties dialog box. On the Variables tab, click the Import variables from sample files button and browse to your multidimensional files. Select one or more multidimensional files and choose Open, which displays a table of variables contained in your multidimensional data. 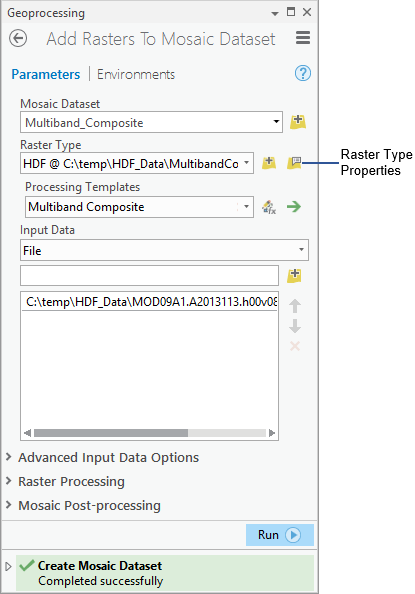 Select the variables to include in the multiband composite mosaic dataset, and click OK to close the Raster Type Properties dialog box. Click Run to run the tool. The mosaic dataset is automatically loaded into the Contents pane and loaded into the display. View the Band Metadata in the Raster Item Explorer pane. Highlight the mosaic name in the Contents pane, click the Data tab under the Mosaic Layer group, and click Attribute Table in the Table group. The attribute table is displayed. Select an item in the attribute table, which enables the Explore Raster Items button in the Selection group of the Data tab. The Raster Item Explorer pane opens. Information about the item is displayed. Expand the Band Metadata category to view the item's band information in your multiband composite mosaic dataset.